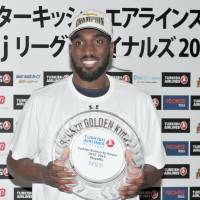 Ryukyu Golden Kings big man Evan Ravenel made a big impact in Sunday’s bj-league championship game against the Toyama Grouses. The Ohio State alum scored nine of his game-high 22 points in the fourth quarter and pulled down 12 rebounds. He made 10 of 14 shots from the field to help the Golden Kings secure their fourth title. 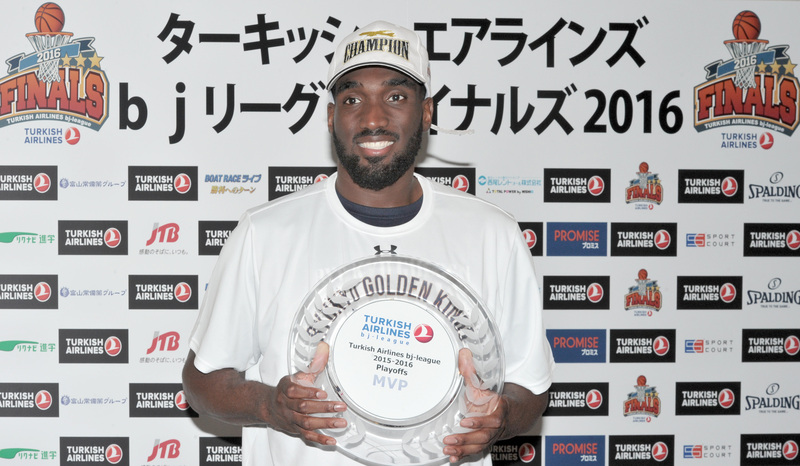 The 204-cm Ravenel was named the 2015-16 playoffs MVP after the Okinawa-based basketball powerhouse completed its 86-74 win over Toyama. Ravenel, who uses his athleticism, speed and strength to match up well in the bj-league at both center and power forward, was poised in the high-stakes pressure that was the final. In the fourth quarter, for instance, he made 4 of 5 shots from the field. Looking back on the season and on securing the MVP honor, teamwork was the main message throughout Ravenel’s on-court interview and in a later news conference. “I feel great,” (but) the Kings “did it as a team,” Ravenel declared. Ravenel praised the Ryukyu faithful for their rabid support. He said that the Golden Kings have the best fan support he’s experienced in his life. During the regular season, the 26-year-old post player averaged a team-best 17.3 points and 10 rebounds a game. In Ryukyu’s six playoff triumphs over the Kanazawa Samuraiz and Osaka Evessa (two apiece), Kyoto Hannaryz (one) and Toyama (one), Ravenel averaged 14.1 points and 10.6 boards. He had four playoff double-doubles. Honestly, though, Ravenel, an imposing physical presence in the low post who made several mid-range jumpers in the Final Four against the Kyoto on Saturday and also against Toyama, admitted he didn’t expect to be the recipient of the MVP award. After all, he said, teammate Anthony McHenry finished with a triple-double (10 points, 15 rebounds, 10 assists). “I really wasn’t expecting it, but I’m glad to get it,” said Ravenel, who hails from Tampa, Florida. Reflecting on the season, he said, “I like this team a lot.” He said the entire organization helped make it an easy transition for him to Japan. “Working together was key to our success,” Ravenel concluded.